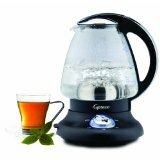 Unit Measures 6.5" x 8.2" x 10"
Water heats up quickly and kettle holds a fair amount of water. Features a covered heating element, with a blue light on the handle to indicate the unit is on. Unit is very user friendly and attractive, reliable, and efficient which saves you money. Units dimensions are 8.5" x 7" x 10"
Great for any type of tea with the slide out chart that gives you the correct temperatures needed for each particular type of tea. If you use the suggested temperatures you will have much better tasting teas. Unit heats up water quickly and efficiently saving you cash. Unit measures 6" x 8.5" x 9.5"
Quick and efficient way for heating water for your tea, soup, hot chocolate, instant coffee, and more.